Netherlands dismantled Ireland as they recorded a 7-1 win in the 4 Nations Tournament in Valencia. Two field goals in the opening quarter gave the world number 4 early confidence. Bob de Voogd led a pacey counter attacked and put his side in the lead in the sixth minute. On the cusp of quarter time, Thijs van Dam doubled his side’s tally with a well-worked attack along the left baseline. The Green Machine settled and Shane O’Donoghue created Ireland’s first solid chance on the counter, but Sam van der Ven made a strong save. Matthew Nelson and Jeremy Duncan were next to test the Dutch resolve with the former’s shot just skimming over the bar, while the latter led a superb attack that saw a goal disallowed on the cusp of half-time. The game looked to have settled into a more even affair but in the 37th minute a nice move led to a penalty corner for the Netherlands and Mink van der Weerden sent a powerful drag flick high into the net. The Dutch took advantage of another opportunity as they picked up a saved Irish shot and countered at speed to earn a penalty corner, this time Jereon Hertzberger sent one of his trademark drag flicks goal bound. 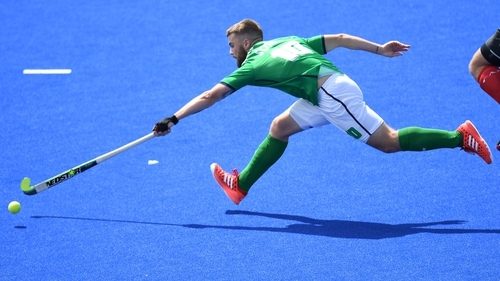 Ireland continued to create opportunities and Alan Sothern won a penalty corner for his side moments later, but the effort couldn’t trouble van der Ven. Van der Weerden got his second from a penalty corner routine and less than a minute later Thierry Brinkman sent a powerful backhand into the goal. Robert Kemperman rounded out the scoring for the Dutch in the 51st minute with a well worked field goal. The Green Machine continued to pressure the Dutch and Sothern got his team on the board with a penalty corner strike in the 56th minute.